Bitvavo - How are the prices determined? All Categories ​>​ Dashboard ​>​ How are the prices determined? These terms will be further explained and there will be an example to further illustrate them. The bid price is the price that the best buyer (the highest bid) wants to pay for a digital currency. The bid price indicates the price the user wants to pay and how many digital currency the user wants. The ask price is the price that the best seller (the highest selling price) wants for selling his digital currency. The ask price indicates the amount for which the user wants to sell its digital currency and also how many digital currency the user wants to sell. 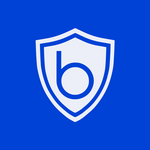 The market price is an indication of the price which Bitavo gives on its platform and is based on the average of the bid price and the ask price. When you decide to buy or sell, the market price will always be (slightly) different from the actual price you pay (in case of a buy order) or receive (in case of a sell order). The spread is the difference between the best bid price and the lowest ask price of a specific digital currency on a specific moment. The best buyer offers a maximum of €999 for a Bitcoin (bid price). The best seller wants to sell his Bitcoin for a minimum of €1.001 (ask price). This leads to a market price of €1.000 per Bitcoin, which is the average between the bid price and the ask price. The difference between the best buy price and the best sell price in this example is €1.001 - € 999 = €2 (spread). There will not be any transaction, if both the buyers and sellers keep their prices as submitted. If one of the buyers decides to pay €1.001 for a Bitcoin, or a seller decides to sell its Bitcoin for €999, then there is a match due to which a transaction will be executed. Let's assume that one of the buyers decides to pay €1.001 for a Bitcoin which results in a transaction. In such case, the buyer would pay €1 or €1 / €1.001 = 0,1% more than the indicated market price. Please note that this difference is not for Bitvavo but is the result of an higher late price than the market price. Consequently, the prices that you pay (in case of a buy order) or that you receive (in case of a sell order) can be slightly different from the indication price. The best buyer in this example offers €0.99 per Bitcoin where the buyer would like to buy 10.000 Bitcoin (bid price). The best seller at that time wants to sell his 1.000 Bitcoin only for at least €1.01 per piece (ask price). In addition, there is a second seller who only wants to sell his 3,000 Bitcoin for €1.02 per piece. In addition, there is a third seller who wants to sell his 6.000 Bitcoin only for €1.03 per piece. In the above example, the market price of the Bitcoin s €1.00, which is the average of the offer price and the ask price. 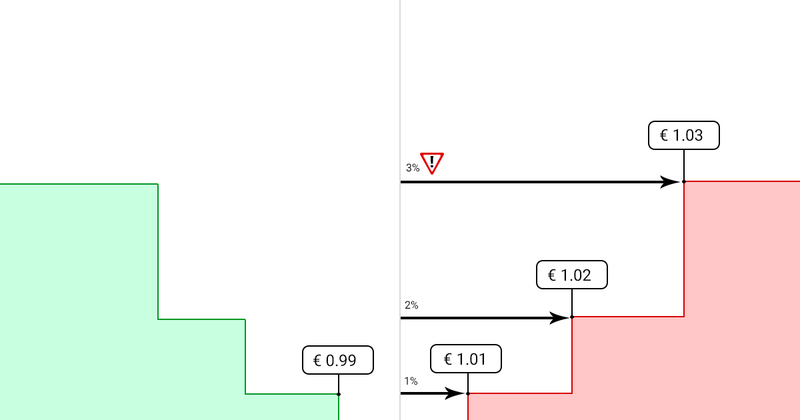 The difference between the best available purchase price and the best available selling price in this example is €1.01 - €0.99 = €0.02 (spread). If both buyers and sellers keep sticking to their own price, no transaction will take place. However, if a buyer decides to pay €1.01 per Bitcoin or if a seller decides to sell Bitcoin for €0.99 each, a transaction will take place. Let's assume that the buyer decides to buy the desired 10,000 Bitcoin all directly and in once. In such case, the buyer needs to pay: €1.01 * 1.000 + €1.02 * 3.000 + €1.03 * 6.000 = €10.250. Consequently, the buyer paid € 250 or €250 / €10.250 = ~ 2.4% more than was indicated. Please note that this difference is not for Bitvavo but is the result of an higher late price than the market price due to the size of the order. To make you aware of this, you will receive a notification if the price you will need to pay differs more than 2% from the indication price. The best buyer in this example offers a maximum of €0.98 for one Bitcoin (bid price). The best seller at that time wants to sell one Bitcoin only for a minimum of €1.02 (ask price). In the above example, the market price of Bitcoin is €1.00, which is the average of the offer price and the ask price. The difference between the best available purchase price and the best available selling price in this example is €1.02 - €0.98 = €0.04 (spread). If both buyers and sellers keep sticking to their own price, no transaction will take place. However, if a buyer decides to pay €1.02 for one Bitcoin or if a seller decides to sell one Bitcoin for €0.98, a transaction will take place. Let's assume that one of the buyers decides to pay €1.02 for one Bitcoin which results in a transaction. In such case, the buyer would pay €0.02 or €0.02 / €1.02 = ~2,0% more than was indicated. Please note that this difference is not for Bitvavo but is the result of an higher late price than the market price. Pleae note: To simplify the above examples, trade fees were not included. Please note that a trading fee up to 0.25% of the traded amount may apply. Why do I receive a notification about an illiquid market? You will receive a notification about an illiquid market if the execution of your order would result in a final price which would differ more than 2% from the (indication) price stated in your dashboard. Please note that this difference is not for Bitvavo but is a result of an higher late price than the market price. To submit a limit order which will only be executed for the submitted price. If you would like to have your order completely and directly executed, the price difference is unavoidable. Why are the market prices constantly changing? The price can change every time when an order is submitted in the order book of a specific digital currency. This is called the “fluctuation” of the market. To ensure that you see the most recent prices, it is necessary to keep the prices up-to-date.